Consuming protein after exercise can help you build lean muscle, says University of Massachusetts Department of Nutrition head Dr. Nancy Cohen. Because of their convenience, shakes made from protein powder such as Gold Standard 100 Percent Whey Protein are popular post-workout choices. However, protein powder use comes with possible side effects. In addition, these products aren't regulated by the U.S. Food and Drug Administration and may contain contaminants. Don't use Gold Standard 100 Percent Whey Protein until you've spoken to your doctor about potential disadvantages. A single rounded scoopful of Gold Standard 100 Percent Whey Protein contains 30 milligrams of cholesterol. If you drink two protein shakes each day or drink one shake and mix an additional scoop into your oatmeal or baked goods as suggested by the manufacturers, you'll consume approximately 20 percent of the 300-milligram daily cholesterol limit recommended for healthy adults. Unless you're careful to strictly control your cholesterol consumption throughout the rest of the day, you may take in more than is healthy. A diet too high in cholesterol increases your risk of heart disease and stroke. According to the Centers for Disease Control and Prevention, 9 out of 10 Americans have too much sodium in their diet. Consuming Gold Standard 100 Percent Whey Protein on top of a standard American diet won't help. Every scoop contains 130 milligrams of sodium. Two scoops a day will provide you with over 11 percent of the 2,300-milligram limit for healthy adults and over 17 percent of your 1,500-milligram daily limit if you are on a sodium-restricted diet. A diet high in sodium increases your risk of stroke, heart disease and high blood pressure, and African-Americans, the elderly and individuals with diabetes, kidney disease and hypertension are especially advised to restrict sodium. The average 19- to 70-year-old man needs about 56 grams of protein daily. A woman in the same age group should have around 46 grams. Consuming more than you need could lead to increased fat stores and weight gain because excess protein is converted to fat, not muscle. In addition, a diet too high in protein can cause digestive problems like diarrhea, exacerbate the symptoms experienced by people with kidney disease and diabetes, and increase the risk of osteoporosis. Gold Standard 100 Percent Whey Protein contains 24 grams of protein per scoop, or 43 percent of a man's recommended daily intake and 52 percent of a woman's. The primary ingredient of Gold Standard 100 Percent Whey Protein is a protein blend consisting of whey protein isolates, whey protein concentration and whey peptides. 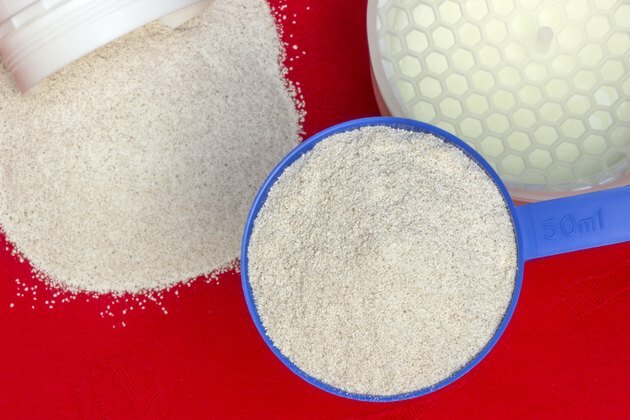 Whey is derived from milk and contains lactose. If you are lactose-intolerant, drinking beverages made from the powder may cause an upset stomach, diarrhea, abdominal pain and cramping, bloating, and gas. Individuals who are allergic to the milk protein casein may develop hives, skin rashes, facial swelling and trouble breathing.